The idea for Dwump came when my wife and I moved into an apartment and were trying to get rid of a sofa. A Greek woman wanted it, but she was new in Brussels and had no way to transport it. Then, as our housewarming party neared, we had piles of cardboard boxes and I was ready to pay anyone to take them away. 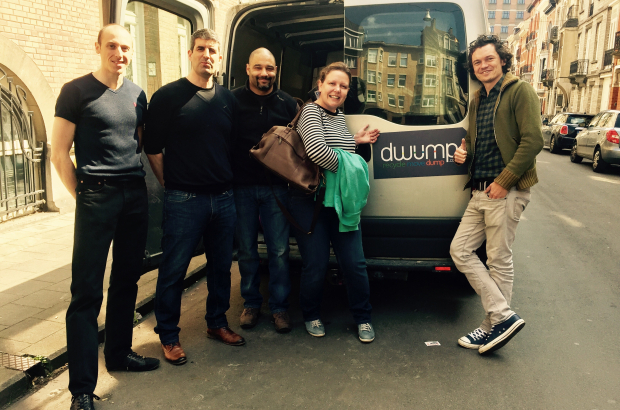 With Dwump, you list items you want to move or dump and provide photos and approximate dimensions. We suggest a price but you can choose your own. The listing goes to all the drivers registered with us. About 70% of the things dumped by customers in our first year have gone to charity shops like Oxfam or Les Petits Riens rather than going to the rubbish tip. Our drivers are electricians, builders, carpenters – self-employed van drivers who already transport household goods. I also work with a removals company, who by registering with Dwump have a supply of extra work. There are also individuals, like Emily the American with her BMW Golf, who does odd jobs to pay for her car insurance. I put my own money into it and I also relied on my stepfather to help fund it. I’m lucky that my wife works for the European Commission, which meant I could commit full-time to building my dream. Belgium is not the easiest country to start your business – but it’s precisely for that reason that Belgium presents a hell of a lot of opportunity to invent something that hasn’t been done here before. I had an uphill struggle in terms of language. I’m from Ukraine; I don’t speak French or Dutch. I became Belgian just before the law was changed, requiring you to pass a language test. My business was born in February 2017 and our son was born a month later. Juggling two start-ups has been tough. Each of them requires feeding and it remains to be seen which one will grow faster. At first I worked from home. When it was time to start coding and developing apps, I went to Factory Forty co-working space in Forest, which was very homely. Accountancy has to be done by me, and I rely on Upwork to find help with translation, advertising and coding. I’ve just begun to scratch the surface of Brussels – there is way more stuff to be moved and dumped here. I’m also looking at Leuven, Ghent and Antwerp. My next step is to find lead investors before I launch a crowdfunding exercise. If I’m successful it would be natural to launch in London. Finding the right people – especially co-founders – has been hard. Most of my friends work for the EU and the mindset of some expats arriving in Brussels is not necessarily entrepreneur-driven. But by going to events and joining an accelerator you can find like-minded people. I am an angel investor. I might be interested in investing in this useful service. Please contact me. The Bulletin has my coordinates through this posting.